The events of the day are foretold by Jesus in the first chapter of the Acts of the Apostles, just before his Ascension. While his followers were with the risen Christ, he tells them, “John baptized with water, but you will be baptized with the Holy Spirit not many days from now” (Acts 1:5, NRSV). He goes on to say to them, “You will receive power when the Holy Spirit has come upon you; and you will be my witnesses in Jerusalem, in all Judea and Samaria, and to the ends of the earth” (Acts 1:8). 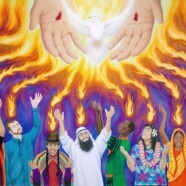 “When the day of Pentecost had come, they were all together in one place. And suddenly from heaven there came a sound like the rush of a violent wind, and it filled the entire house where they were sitting. Divided tongues, as of fire, appeared among them, and a tongue rested on each of them. All of them were filled with the Holy Spirit and began to speak in other languages, as the Spirit gave them ability. Now there were devout Jews from every nation under heaven living in Jerusalem. And at this sound the crowd gathered and was bewildered, because each one heard them speaking in the native language of each” (Acts 2:1-6). We celebrate Pentecost as the inauguration of the Church’s mission in the world. Empowered by the gift of the Holy Spirit, we are to go out into our neighborhoods and the wider world—to Jerusalem, to Judea and Samaria, and to the ends of the earth—witnessing to the risen Christ. The Day of Pentecost is identified by the Book of Common Prayer as one of the feast days “especially appropriate” for baptism (Book of Common Prayer, p. 312). Because of this, Pentecost is also known as “Whitsun” or “Whitsunday” (“White Sunday”), a term used to describe the white baptismal garments worn by those who were baptized at the Vigil of Pentecost and then worn to church on the Day of Pentecost. We have just celebrated Jesus being risen from the dead. Jesus’ resurrection is about God loving us so much that he is willing to go to any length to find us – in all the wrong places. He comes looking for us when we are down and out, when we are at the end of our rope, when all hope seems to be lost. God rolls back the stones that seem to bind and confine us to set us free. Resurrection has no meaning, purpose or place unless, like Mary, we go and tell. Resurrection has no meaning unless we can share the good news with a world clinging to Good Friday. In a Poem by Gerard Hopkins, he uses the noun Easter as a verb – let him Easter in us. Let Easter come and dwell where we live, let it transform our lives fully. It can give us hope, meaning and courage – something our hearts long for. We must all live as God’s Easter People, practicing the hope of Resurrection each day, telling the good news to all who need to hear. Continuing with making things right for yourself and the community, Jesus tells Peter today to forgive “seventy-seven” times. Wow. As humans it is hard to forgive certain things that happen to us, especially if someone has hurt us on purpose. Jesus then goes on to talk about the “kingdom of heaven may be compared to a king who wished to settle accounts with his slaves.” Ouch; this is a totally different view of heaven that he has spoken of. Where do we go from here? We have to work on it; for some hurts we must forgive; the hurt we can carry will become such a burden that it will cripple us over time. Small hurts can pile up and fill the biggest backpack, heavy enough to break us. We need to forgive for ourselves – so that we can move forward with true joy. If the truth be told, we can be processing and feeling a deep hurt over and over, but chances are the person who did the hurting hasn’t given it a single thought. A wonderful book that can help us with this process is “The Book of Forgiving: The Fourfold Path for Healing Oursevles and Our World” by Desmond Tutu and Mpho Tutu. In this weeks’ lessons we hear about how we need to speak our truth to those who have hurt us. Conflict – who wants to have more of it? Don’t most of us avoid conflict at all costs? Yet here we are and this passage is quite clear – the person who is injured is responsible for going to the person who did the hurting. That sure doesn’t feel or seem fair; yet Jesus persists in telling us we need to make things right – right for the community of God. There is a story that was told by C.S. Lewis in The Great Divorce; Lewis painted a portrait of a city that was almost uninhabited; all of the people live on the outskirts of town. He called it an image of hell. This happened because the people disagreed with each other and instead of trying to make it right they moved; they were living on the fringes of life. When we think about that, it seems silly and almost even stupid. Jesus is asking a lot this week; but after all He has done for us, it seems we could muster some courage and do as he asks. Lord Jesus, we give thanks for work, and for the many works you have given us to do. Hear our prayers on this day of rest, and strengthen us for the week ahead. We pray that you would be present with those who work by day, and those who work by night; those who work near, and those whose work carries them far away; and we pray for those who in this uncertain time have no job. We pray all of this knowing that your labors on our behalf never cease, and that your yoke is easy, and your burden is light. Amen. Really? Jesus gives Peter the keys to heaven and then tells his disciples not to tell anyone that he is the Messiah. What would you do in this situation? Were the disciples people that could hold a treasured secret? Or were they people that would whisper it to their families and friends that Jesus was the Messiah? Can we imagine how excited they must have been to hear this great news? Does Jesus really want his followers to keep this a secret? Or does Jesus know that they can’t keep a secret at all and will share it with everyone, one by one all over Judea? Is it Jesus’ plan for this to happen? To get His message out one person at a time? Suddenly a local woman comes out of the crowd and starts shouting at Jesus. ‘Take pity on me, son of David!’ Her daughter is being tormented by evil spirits. ‘Take pity on me, son of David!’ Clearly the Mother is desperate. But Jesus and his friends are moving on and He’s not saying anything. His friends want her to go away. But, isn’t Jesus supposed to be a healer? The woman comes right up to Jesus and kneels down before him. ‘Lord, help me!’ Then Jesus responds, ‘It isn’t right to take the children’s bread and throw it to the dogs.’ Dogs! That’s what some Jews called non-Jews. ‘Yes,’ she agrees, ‘but even the dogs under the table eat what the children drop!” Jesus says “You have great faith! As you wish, so let it be done.’ And the girl is healed. Is this what Jesus means when He tells us that we need to have faith? How did this Canaanite woman have the courage to keep asking? Maybe because Moms would do anything for their children or did she believe the things she heard about The Son of David? And for us…. Do we have faith big enough to see God’s plan working in us? Do we want to give up when things don’t go our way? This week might we reflect on what this passage is saying to each of us individually and how we can grow our faith? Walking on water has come to be synonymous, even outside the church, with the idea of taking a risk. There is little doubt that Jesus wants us to “get out of our own boat and follow Him.” Little doubt Jesus wants us to keep our eyes focused on him and his mission; He wants us to have the gift of faith. What does that mean for us? How can we step out in faith if we are like Peter and are afraid? Yes, Peter did step out of the boat, but only after Jesus said “Come.” Before that he was fearful (as most of us would be) of the storm that was brewing and then the miracle of walking on water. Where can we, as His people, be bold and unafraid to step out and take a risk? * The above was written Friday morning, before the events of Charlottesville unfolded; but they have become even more timely. Jesus took his disciples up on the mountain hoping to find God there. They were on a quest, seeking God’s presence. Like Peter and John and James, God is calling all of us to climb the mountain with Jesus. Jesus leads his disciples up there because he knows that’s where God lives. The same is true for Moses in the reading from Exodus — God is found on the mountaintop, where your vision is clear and all the noise of everyday life subsides. But even though it is easier to find God on the mountaintop, that is not the only place God can be found. God feels especially close in the beauty of the natural world: stars shining in the sky, waves falling on the ocean shore. Poets and visionaries can attest that these are places you can find God. When you’re lost or lonely or wondering what’s next, find a church to pray in, or a mountain to climb, or a forest to walk in — remember those places you have felt God’s presence before and go seek God there again. God is so patient with us. The earth illustrates his patience. Trees grow year after year, season to season by His abundant blessings. Flowers never begin as beautiful as they are in full bloom. We are no different. We grow and change with time. Faith as large as a mustard seed. We know from years of hearing this Parable that a mustard seed is a weed that grows and takes over wherever it is scattered. “The kingdom of heaven is like a mustard seed”…..we could interpret this to mean that God’s love takes over like an earthly weed, spreading love and acceptance wherever it lands. Is there somewhere or something you might want or need to grow and change this week? Wheat and weeds. Oh Boy! Not to talk politics, but at this time in our nation we can all agree we are divided. We seem to be looking at each other asking the burning question, are you wheat or weed? Each side seems to now consider the other as the weeds. People are cast off because of political beliefs. Friends are unfollowed, unfriended and deleted because a post hits wrong. We have become judge and jury – and in this age of technology, quite expeditiously! If truth be told, don‘t we all have a bit of weed in us? But what if we are meant to live and grow together in the same soil? And aren’t we all called to live in the kingdom without judgment? Hard to do these days. When God calls us home, God will decide what we will be called. Isn’t is a bit of a relief that all we have to do is to let go and live? This week let us all attempt to let go of the judgment and just breathe. The Parable of the Sower; most of us are familiar with the usual take on this piece of scripture – e.g., the seeds are sown on different types of “ground” with different results. The thought is that the seeds are sown in us; each of us different in what may or may not grow. But….What if we turn this around – what if, instead of it being about “us” and our shortfalls, it is about the Sower…..then it all sounds quite different. The Sower is abundant with his seeds and generosity – he tosses them everywhere and is unconcerned about where they land. The Sower is generous, he keeps sowing more and more, not worried about where they land or if there will be enough crops in the Fall. The Sower is casting about his seeds everywhere – on bad soil and good, He does not judge., He gives of His abundant generosity and love for each one of us. All of Jesus’ teachings are in Parables. The stories that the Sower tells are for us to ask questions and, surprisingly, the stories ask questions of us. What questions are you hearing this week as you reflect in a new way. Abraham was prepared to obey God’s command and sacrifice his beloved son; the son who was to provide descendants. For most of us, this is unthinkable; to be asked to sacrifice a person that we love so much. This coming week reflect on how this might play out in our world today and what each of us be willing to do if God asked. This verse is the “welcoming verses”, where Jesus commands us to welcome all. In our faith tradition we welcome all regardless of race, creed, gender, sexual identity, etc….no one is to be left out. Nevertheless, if we are to be honest about the church we know and love, we might have to confess that, though we define our borders as broad, we define them still – but much more subtly. We can meditate or reflect on these verses and notice what comes up for us. Hagar is sent out from her home and out of the only community she knows. She had no idea what will happen to her and her son except possible death. When each of us find ourselves out of our own comfort zone, how can we have the continued father to go forward into the unknown? In Matthew 10:24, Jesus tells us that we are all equal to one another. Given this clear message, how might each one of us reflect upon our own personal judgments, biases, etc.? Abraham and Sarah were advanced in age. Yet the Lord gave them their greatest desire, a son. God knows your wildest desire. What might you do if it came true? We are here to spread God’s love. We can do this in so many ways; each with our own vision and uniqueness. We have it much easier than the Disciples; we can wear shoes, pack clothes if needed, etc. We also have the freedom in this country to do this. How are you feeling led these days to spread God’s love? Might there be something new for you on the horizon? For many, the only way to understand the Trinity is through Jesus Himself. When we begin to walk with Jesus, we must begin to look at reality the way that He looks at reality. We encounter Jesus as a young Jewish man and we must spend some time looking at the world from that perspective. Jesus accepts the teaching of the Jews of the Pharisee school—for the most part. We could say that Jesus is formed as a Pharisee but also by the presence of God in a very special way. He calls God His Father and eventually also says that He and the Father are One. Slowly Jesus reveals to us that God is a reality that is Triune and which reflects love within itself and outside itself. Most of the time we don’t spend much time reflecting on this reality because it is so far beyond our capacity to understand. On the other hand, this mystery of the Trinity, this mystery of Jesus, this mystery of the Father’s love—this is the deepest nature of our world and draws us all to learn to accept God’s love and forgiveness. of the God within each of us. and to fan it to flame in others. for women’s power and presence. The darkness will be no more with the birth of the royal Savior, for the promised kingdom of God has arrived. Question: Has the light of Jesus come into your life? How have you responded? The fullness of God’s grace descends upon his people with the birth of Jesus. His life has brought us salvation, by redeeming us from sin. Question: Does this Good News call you desiring sharing it with others? How will you do that? The shepherds scripture speeks of, were thought to be those that cared for the special sheep used in the Temple sacrifices, who were chosen to receive the news of birth of the “lamb of God”. Question: How will you respond to this lovely message and gift from God? Question: Are you able to accept God’s gift of the birth of the promised Messiah? What is your response? Paul considers himself called to be a slave to Jesus, who is his Lord and Master, thus he responds to Jesus’ call, which he sees as a task with special responsibilities. Question: Do you understand that in a very real way at your confirmation you also received a task that you accepted? How have you fulfilled your promised task? Jesus is born of the Holy Spirit using Mary. Jesus is the mirror of God and the Jews believed that the Holy Spirit embodied God’s truth. 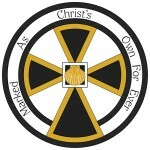 Question: Do you accept this doctrine of creation and recreation put forth by Matthew? This is what we know about prophets: they all know that they are called by God and that He tapped them out for His service. Question: Are you a prophet? Do you know God well enough? Are you connected to Him enough to be a prophet? Do you wish you were one? This reading tells of the connection between Moses receiving the Law and the New Covenant life of Jesus. Question: Do you see and understand the reason for these two promises used by God to reach and teach His people? How will you apply them to your life? A story about how God calls us to live out our love for all those He has created, teaching us no one should suffer due to laws and systems. Question: Can you be Jesus to the people you meet, always being ready to minister help when and where needed? Hear God’s words of disgust that his people continue to ignore his word, to live their lives for the betterment of all people. Question: Do you understand that the basic quest of God is, that we live so that our actions speak louder than our words? Can you do that? When will you begin? A teaching on faith, recalling how faithful God’s servants followed all God asked of them, with some experiencing amazing miracles. Question: Do you trust God enough to accept his care for you when you follow him? If not, why not? Our culture is one of seeking plenty, here Luke details how wrong that is and explains our need to live each day, as if it was to be our judgement day, for we never know. Question: Do you understand that if you have been given much, you must be responsible for using a greater portion of it in God’s ministry. A story of abiding love, continuing even in the face of judgement and rejection. QUESTION: Love given unconditionally should be reciprocated and returned. Do you receive God’s love by responding to God’s requests asked of you? Paul teaches us to respond to God’s love by learning to direct our lives in accordance with what God desires for and asks of us. QUESTION: Are you able to accept and respond to what and how God would have you live? Luke explains the need to make choices in line with how Christians are to live. QUESTION: The Christian life is one of not only love, but discipline. Are you able to rein in desires that lead you stray? How do you do that? A faithful servant receives the assurance of God’s on going care and protection, for his life. Question: Do you sense God’s care for you each day? How do you respond? Our faith gives us the strength and protection to live into the life Jesus calls us to. Question: Do you make the choice each day to live for Jesus and his Way? What does that mean to you? Because Jesus realized that people need to see his power in action, once again he heals a man with demons. Question: Have you ever seen a person touched and healed by Jesus? How did that make you feel? A story of greed and dishonesty between a king and one of his subjects. Question: Can you list the deceitful ways Ahab and Jezebel acted? How does this make you feel? A lesson that shows us how easily we can slip into a sinful life style. Question: Do you see how each day we need to decide to live a Christian life? How do you accomplish that choice? How much we seek the life of a faithful Christian is a testimony to our choice to follow Jesus’ words. Question: When you make a decision, do you base your choice on Jesus’ teachings? How do you process that choice? Elijah restores a child’s life, and the mother realizes Elijah works in union with God. Question: How must you live to be used by God to bring others to a faith like this? Do you feel God’s call to you to do more for Him? Paul witnesses to the fact that all he teaches comes to him directly from Jesus. Question: When Jesus calls you to share your faith journey, are you trusting enough to do so? Jesus’ deep compassion moves Him to raise a woman’s son to life again. Question: What does this act of Jesus teach you? A contest is held between the Lord God and the God of Baal. This story is a witness to the deep faith of Elijah. Question: Do you live with the assurance and faith in God that Elijah did? How do you recognize that kind of faith? Paul is defending his teachings which were a witness to what God had done for him. Question: Do you see the importance and need for your personal witness about God in your life? What can you do about that? Luke writes of the benefits of a life lived in perfect faith and union with Jesus. Question: Is your faith and trust in Jesus and what He has promised this strong? What things can you do to strengthen your faith? A rendition of the creation story through the eyes and mind of a spiritual presence. Question: Does this reading give you insight into the awesome gift that God created for His people? What do you see and what will you do with your gift? Each day we trust and live as a child of God and experience more of God’s gifts. Question: Is your faith deep enough that you are able to access the power God has given you? How do you know? Jesus calls the Holy Spirit the Spirit of Truth, for it is the Spirit that was given to teach us. The closer we live to Jesus, the better we know him. Question: List what principles you have learned and now live by.